A comprehensive overview of the fecundity and diversity of the Pacific coastal waters stretching from British Columbia to Mexico. Ulanski (Geology and Environmental Science/James Madison Univ; The Billfish Story: Swordfish, Sailfish, Marlin, and Other Gladiators of the Sea, 2013, etc.) warns that despite the abundance of marine life in its waters, its ecology is threatened by commercial overfishing, global warming, and recreational usage. 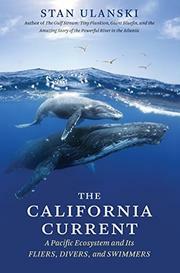 The California Current is a dynamic waterway with a rich source of nutrients provided by upwelling waters that “supports a vibrant marine ecosystem, from tiny plants to giant whales.” Migratory blue-fin tuna, salmon, oysters, sharks, turtles, seabirds, and more frequent its waters. Because of this diversity, it “has been likened to the species-rich Serengeti Plain of Africa.” Yet despite its fecundity, it is threatened by “dramatic changes in ocean chemistry that are now occurring…on a scale not seen in recent history.” This is partly attributable to the increasing acidification of the ocean, caused by global warming, which occurs “when atmospheric carbon dioxide dissolves in seawater, forming carbonic acid.” Although seabirds are not themselves a food source, they act like the canary in a mine. An analysis of their droppings shows a shift from sardines to anchovies in their diet. Although this has yet to directly affect the catch of fishermen, it indicates increasing pressure on the fish population. The fishermen’s reliance on airplanes to reveal the most productive areas for fishing disguises looming shortages by allowing them to increase the radius of their operations. Ulanski supports the enforcement of global agreements to protect spawning grounds and the creation of carefully managed habitats for threatened species. However, in a hard-hitting conclusion, he reports that positive advances in environmental regulations have been partially derailed by political opposition, particularly in Oregon and Alaska. Shockingly, he reports a congressional moratorium on designating new areas that has been in effect since 2000. An informative exploration of the many issues facing a significant ecosystem.